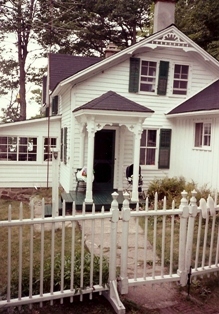 The Darlingside site is located on the St. Lawrence River just east of the Thousand Islands Bridge. Thomas Darling (1813-1882) and his wife Janet Findlay (1825-1906) came to the area from Berwick, Scotland in 1837. Mr. Darling began a cordwood business in 1837. At that time, trade in cordwood figured significantly in the economy of the Township. Local residents from as far north as Blue Mountain would bring wood to Darling's depot. In turn, Mr. Darling would supply wood to steamers traveling along the St. Lawrence River. As his business flourished, Darling recognized the need for a general store. His situation was ideal to serve both those in the Township and the steamers. The store was opened in 1845. It was closely associated in a barter-and-credit system of trade with the wood business. This type of trade was very common in early Canada. Little cash would change hands, but products, both raw and finished, would. In 1851, Thomas Darling purchased Lot 24, Concession 1 of what was then Lansdowne Township. He paid 125 Pounds for the property. Later that same year, Darling purchases Lot 1 Broken Front of Escott Township for 200 Pounds. This property was comprised of 200 acres. Darling was also granted Commons Lot A Broken Front of Escott Township from the Crown in 1856. This land was comprised of 7.5 acres. Thus, the larger property known as Darlingside was assembled. During the later half of the nineteenth century and into the twentieth century, members of the Darling family purchased a substantial amount of property. From the 1845 census, it is evident that at that time the Darling family only consisted of Thomas and Janet Darling. Eventually, they had ten children. Two of the eldest boys died at very young ages. The majority of the family is buried in Lansdowne Cemetery. Excellent records remain of this important family. Early Census Records are with the Leeds and Grenville Branch of the Ontario Genealogical Society. In addition, the wills of the Darling family are recorded on microfilm and can be found at the Land Registry Office in Brockville. Each of the Darling children was unique and, to some, eccentric. The Darling girls were well educated. Each boy, with the exception of Arthur Darling, was also extensively involved in the community. The family exercised considerable power in the community because of its economic status. Some of the Darling men held public offices. For example, Thomas Darling was Reeve of Lansdowne Township during the 1860-70's. His son, Thomas J. Darling, was Reeve in the 1880-90's. J.D.W. 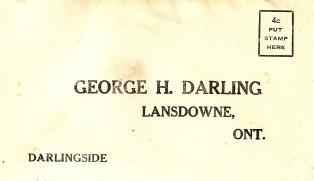 Darling was Township Clerk during the 1880's, a Justice of the Peace in Lansdowne during the early part of this century, and also operated an insurance company in the village. One of the girls, Margaret, provided mortgage funds for many of the farmers starting up in the area. George was a tea merchant who sold tea throughout eastern Ontario and New York State. The family were staunch Presbyterians and active in the support of the church in Lansdowne. Much of this information is available at Queen's University Archives as well as the Provincial Archives in Toronto. The architecture of the Darlingside buildings is also of significance. On Lot 24, Concession 1, there are four buildings: the Darling General Store, the house, a barn and a boar house. The house and store are of the greatest importance. The store was operated from the 1840's to the 1890's. Its architecture provides a good representation of the American Classical/Georgian style. Considering its age, the store is in amazing condition, virtually unaltered from its original state. 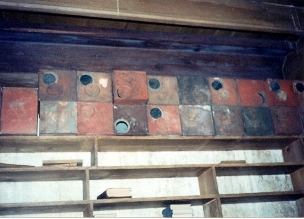 The store records and ledgers are very well preserved in the archives mentioned above. They provide great insight into the lives of a middle class mercantile family in Upper Canada. There is also preserved original merchandise dated to the 1800's. * Information compiled by Lisa Thompson and first published in the January 1994 newsletter. In 1991, Darlingside was advertised for sale. A small group of locals was concerned that another piece of history would disappear with no record. That was the beginning of this society. Over the last four years, Mr. Robert Wallace and his sister, Louise Hockey, have been generous in allowing us to tour, photograph and record the premises. 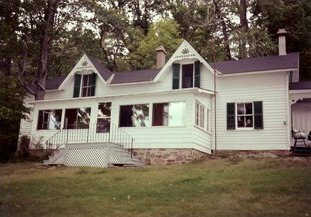 This property, became one of four Lisa Thompson researched in our first summer program. In June, the final parcel of Darlingside, containing the four buildings, was sold. Diane Hall, Township Clerk, immediately arranged for us to tour the property again. This was done early on Friday morning June 16, 1995. We asked for permission to remove all remaining paper from the store for later sorting. Permission was granted provided we finished before noon on Monday June 19, one step ahead of the auctioneers. Mrs. Hall provided three men and a truck from the road department and three of the office staff, as well as going herself. We removed many boxes and trunks of papers from the store as well as books and papers from the house. We were also allowed to remove several small items of historical interest. Among these were a primitive treadle sewing machine and a hand operated vacuum cleaner. On a recent visit to the Henry Ford Museum in Dearborn Michigan, I discovered an exact mate of our vacuum cleaner. It is the oldest in their Home Arts section, listed as "Suction Cleaner. New Home Vacuum Cleaner. R. Armstrong Manufacturing Co. Cincinnati, Ohio. 1910-1915." We have made only a small dent in sorting this material. It is a long, slow, dirty job. At some later date we will attempt to publish a list of the material. Of interest so far are voters lists for 1863 & 1868, blueprints for the Presbyterian Church and the Drill Hall and a file of invoices from Alan Earl, Merchant, Lansdowne Tilley Post Office. 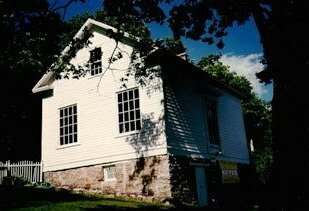 The Historical Society would like to thank Mrs. Hall and the Township Staff for their assistance in obtaining, removing and storage space for this material until we can sort it. Especially we would like to thank Mr. Robert Wallace for allowing us access to the property and permission to remove the material. As I left that Monday afternoon, Mr. Wallace, great grandson of the founder Thomas Darling, sadly said, "Well, I guess this is the end of an era". After 150 years of continuous use by the Darling family, I believe he is correct. The Historic Sites and Monuments Board of Canada designated Darlingside as a National Historic Site in a plaque-unveiling ceremony on Saturday September 20, 2000. Three plaques have been placed in the parkette above the Darlingside property, just east of the Thousand Islands Bridge. They picture the Darling store and the Thousand Islands area, and outline the importance of this business to the early St. Lawrence shipping business. The event was chaired by Dr. Jacques Monet of the Historic Sites and Monuments Board of Canada. Reeve Harold Grier brought greetings from the Township; and Alan Lindsay, President of the Historical Society, spoke of the Darling family and their business interests. Guest speaker was Joe Jordon, Member of Parliament, Leeds-Grenville. Spring 2008 - LTI Historical Society and community members were saddened to hear that the Darling house had been dismantled; only the store remains. The loss of this gem leaves a large hole in our heritage. 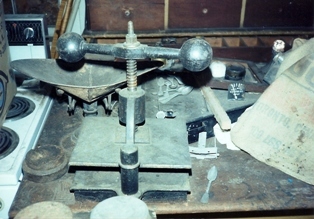 Thankfully, we have several artifacts and photos to document it's importance in our area.